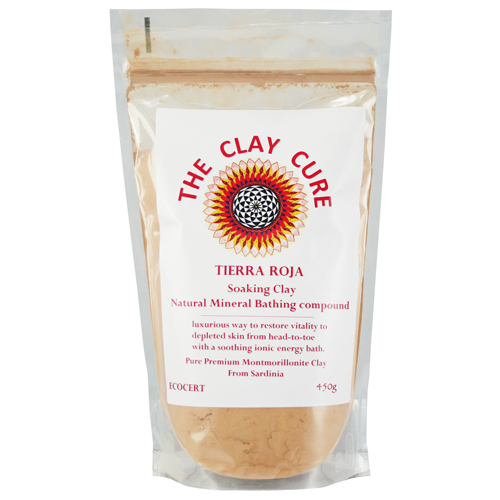 Tierra Roja Soaking Clay - 450g by The Clay Cure Co.
Clay Cure Tierra Roja Soaking Clay is a luxurious way to restore vitality from head-to-toe with a soothing ionic energy bath. 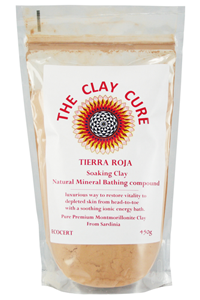 Tierra Roja Soaking Clay is a pure Montmorillonite clay (98%) that carries a strong negative ionic charge and a wealth of iron oxide giving the clay its beautiful reddish hue. Tierra Roja Soaking Clay will stimulate the circulatory system just below the surface of the skin allowing your lymphatic system to drain stored toxins from your body. Regular bathing in Tierra Roja increases blood flow that leads to more oxygen travelling to your cells. It will leave you feeling relaxed, clear headed and deeply refreshed. Your skin will be soft and rejuvenated thanks to the deep cleansing action of the clay. Use ½ to 1 cup of Tierra Roja in one bath filled with warm water. Soak your body in clay water for a minimum of 20 minutes. Shower the residue of clay from your skin. It is important to drink plenty of water to re hydrate the body. Premium red montmorillonite clay from Sardinia. Due to the detoxification process, some darker residue may be seen in the bath. This is due to toxins being removed from the skin or pores through the adsorbing action of the clay.